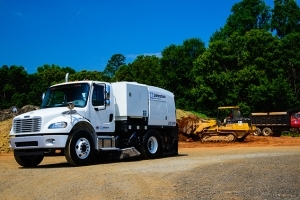 The Johnston ES351 mechanical sweeper is the newest model from the world's largest manufacturer of street sweepers. It underscores Johnston's entry into the competitive 4-wheel chassis mounted sweeper class. Johnston's "Easy Sweep" mechanical sweeper is matched with Freightliner's M2 chassis and together; they offer both superior performance and a level of comfort and drivability that any operator will appreciate.